You'll be £19.99 closer to your next £10.00 credit when you purchase A Strategist in Exile. What's this? Order within the next 4 hours, 49 minutes to get your order processed the next working day! Thucydides was the chronicler of the almost 30-year long Peloponnesian war, which came to a close with Sparta's victory over Athens in 404 BC. His famous historical work was preserved, but ends abruptly many ears before the end of the war. It was continued decades later by Xenophon, with his "Greek history", Hellenica. Following Athens defeat by Sparta, an Athenian court judged Thucydides to be responsible for the defeat, forcing him to flee his hometown and live on the northern coast of the Aegean Sea until the end of the Peloponnesian War. After his return from exile, he meets with the young Xenophon, but disappears without a trace shortly after. 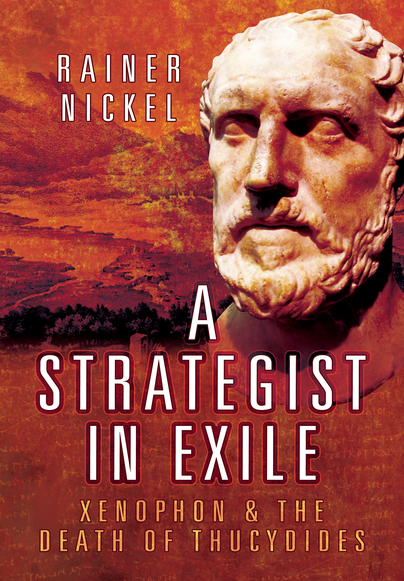 This book covers Xenophon’s search for Thucydides, the "failed strategist", in order to protect his friend from the Thirty Tyrant’s regime of terror, as well as save some important historical documents which he had placed in Thucydides’ safe keeping. The narrative is based on the linking of historical reports of the operations, plausible constructions and imagined recollections in order to create a coherent narrative, allowing us a first-hand insight into the operations based on fact, not fiction. traditional literary themes and motifs associated with specific places. Dr. Rainer Nickel an established German author and a classicist, writing for the series "Tusculum". He is also the editor of the magazine "The classical language teaching". He is one of the leading educationists in the teaching of classics in Germany.